Ed is in Congo from February 2-10, from 2-5 in Bunia, from 6-9 in Isiro, and then the night of the 9th in Entebbe, returning to Nairobi on the morning of the 11th. The trip started at 4 AM on Monday morning to catch a ride to the airport at 5 AM and a 7 AM flight. It is the start of the rainy season in Congo, so everything is wonderfully green. 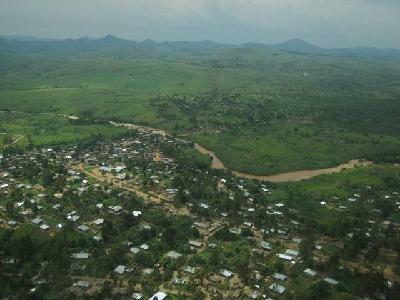 The rain did delay Ed’s arrival by small aircraft in Bunia (above), but only by a couple hours. 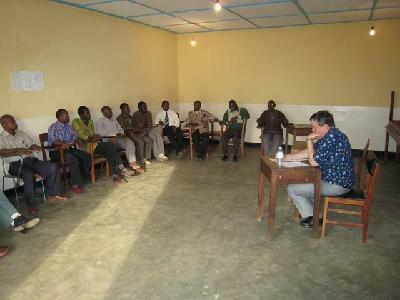 The main purpose of the trip to Bunia is to evaluate the translation degree program at the Shalom University of Bunia. The program just started. It is being lead by Kabucungu Hand-jinga (above). We were involved with his training in Nairobi a few years back. Ed found that even though the program had a few hiccups, it is going extremely well for being brand new. Ed met with the 12 students in the program (above). One died suddenly of meningitis in December or there would be 13. They are all excited about the program. They are learning things about their languages they never knew before even though they have spoken them all their lives. It was contagious to hear their enthusiasm for giving their peoples God’s Word. 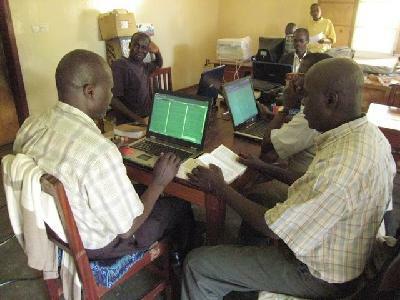 I took time out to visit a little center where teams of translators from three different languages are working, some of whom we helped train. Seeing this group doing a last pass over the whole Bible in their language was very a lot of fun. They were really jazzed. The first day here I tripped going up these stairs and banged my right knee pretty good. Within a couple hours it was getting very sore and stiff. I could hardly go up and down stairs. I was concerned that I would wake up in the morning with it all stiff and swollen. I went to a Bible study and a missionary doctor there gave me some Ibuprofen and they prayed for me. The next day — No problem! The Lord is good. With the green and the hills, this is a beautiful place. It could also be very prosperous, but it has been wracked by conflict, mostly driving by those wishing to seize its incredible mineral wealth. The Frangipani blossoms (above) outside my door remind me that God makes everything beautiful in his time. After Bunia, I went to Isiro where I spend four days going around with this wonderful man, Pastor Atulu, dealing with many issues, including starting work in six more languages in this area. At one point we ran out of gas a ways out of town. Atulu tipped the motorbike on its left side which enabled us to go another half mile. Then he bought 1/2 liter (1/7th of a gallon) of gas from a roadside vendor for 1,000 Congolese francs, or $1.49. 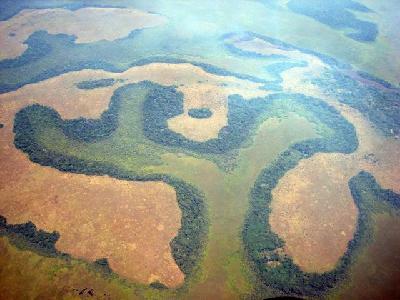 The forest in Upper and Lower Uele Districts has these wonderful patterns. Flying over them is an experience in the wonder of how great is the God of creation. 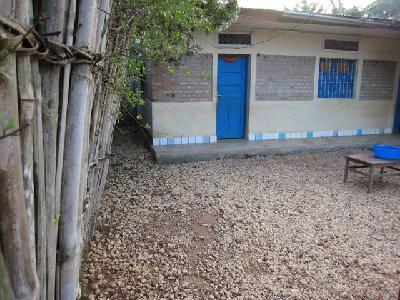 This is the little room, on one end of Atulu’s house, where I stayed while I was in Isiro. I had a mosquito net so I was not bothered at night. The family has an outside toilet and shower. They heated me water over a wood cook fire every evening for my shower. 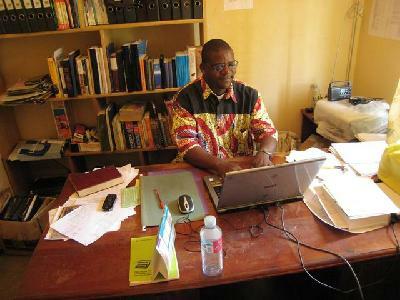 This entry was posted in Bible translation, Congo, National translators and tagged Bunia, Congo, Isiro, national translators. Bookmark the permalink.